As pumpkins arrive in their many shapes and sizes, we know fall has begun. The butternut squash is a firm favorite alongside the Hokkaido. Many shy away from preparing pumpkins, and even though a butternut squash can be a bit intimidating in size and shape, with the right technique it’s a cinch . You can even eat the peel when you cook the squash low and slow. Depending on the recipe, it makes sense to peel the butternut squash, especially if it needs to be ready in a hurry. The delicate squash inner with its nutty, buttery flavor literally melts in your mouth. Butternut squash is highly versatile and can be used in soups or risotto, or roasted in the oven in gratins or as a pumpkin cake. 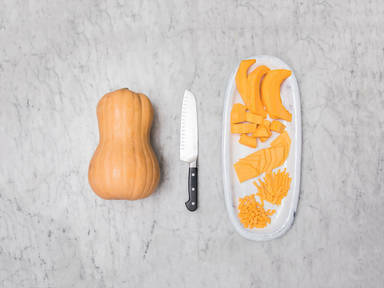 Take a look at our video to see how to peel and cut a butternut squash correctly, whatever the recipe.